Following the success of Bullitt, a film about the world’s most famous endurance race with Steve McQueen as its star should have been a hit. It wasn’t. Worse, making Le Mans cost McQueen his family, his company, and many of his friends. John McKenna, director of Steve McQueen: The Man And Le Mans, which will be shown at the Jalopnik Film Festival in LA later this month, explains how it went so wrong. When I first saw the trailer for the new McQueen film I knew we had to have it for the film festival and I’m proud to say we’ll be one of the first in the United States to show it. I’ve always been fascinated by the film, which is so unlike anything Hollywood has produced since. Given the disaster that surrounds Le Mans it’s unlikely that we’ll see anything like it ever again, as McKenna explains. Jalopnik: Le Mans is revered by car enthusiasts, but the making of the film was in many ways a series of disasters. Can you explain a little bit about what happened? JM: The film should have been a surefire hit. Steve McQueen – the biggest star in the world – in a car going at 250 mph, off the back of Bullit and THE car chase of all time that had broken the box office. But that’s not what played out. Steve wanted to make more than just another Steve McQueen film. He had a love of the sport of motor racing that cut deep, and it was his aim to try and explain to people just what it was about this sport of his that made men risk their lives. For that’s what was happening at this time – deaths every other weekend. Hollywood signed on the dotted line expecting their surefire hit. Steve had something else in mind. And so began a battle to see who could get their way. During the course of the battle, a driver lost his leg, another was nearly burned alive, an actress went through the windshield of a car that Steve was driving, he found himself on Charles Manson’s death list. He lost his wife, his company, control of the film and, after the film, he never raced again. But still he kept going – to make his life’s dream – the ultimate film about racing. You’re making a film about a filmmaker trying to make a film and barely succeeding. What made you want to tackle this project? Many things. The idea was brought to us by Andrew Marriott, one of our Executive Producers. Andrew is a car “lifer”, in his words – he knows motor sport inside out. His enthusiasm for the era, the cars and the drivers – and its place in motor sport history was infectious. We got straight away what they saw in 1970 – Steve McQueen and these beautiful, frightening beasts – what’s not to love! But it was more than that for us. It was about trying to get to the core of WHY a superstar at the top of his game was willing to risk everything – and we mean everything – to make this film. We found the potential for getting under the skin of a superstar who everyone thinks they know intriguing. A lot of actors try their hand at racing and some are fairly decent, how did Steve McQueen match up against the pros? He was really good. He loved it but I think he proved his mettle on the track with the performance with Peter Revson at Sebring in early 1970. After this, I think the drivers looked at him differently. He wanted to race the actual race at Le Mans, but the insurance forbade it. But the filming was done at race speed. Would Steve have given the pros a run for their money in the race? I’m not sure. But for them to be willing to go on the track side by side with him at that pace – he had to be good, they had to trust him. And they did. 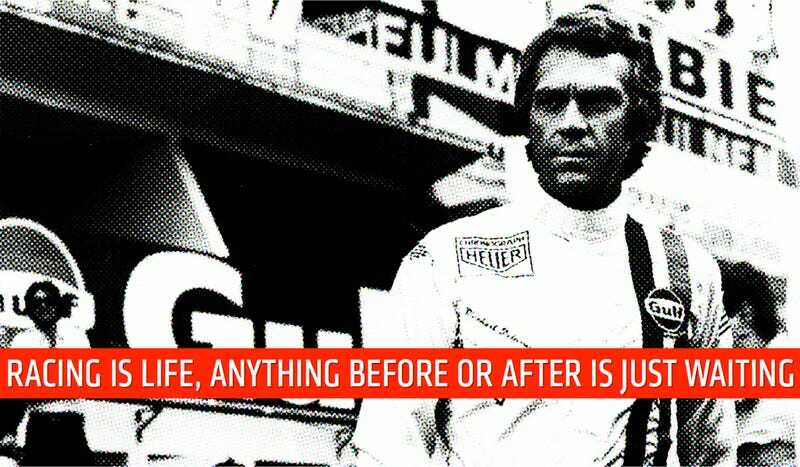 Your film Steve McQueen: The Man and Le Mans has some unseen footage. Can you describe it and explain how you got ahold of it? We work with a fantastic Archive Producer called Richard Wiseman who is like a bloodhound! Quite early in the production, Richard found an unbroadcast documentary called “Song of Le Mans” in a Parisien basement. This gave us an idea that there might be more out there. We then spoke and met with John Klawitter, who produced a 14 minute “featurette” at the time – behind the scenes. He told us he had made a 45-minute version but didn’t know where it was. His son then went and found it in a dark corner of his garage! By this point we knew we had good material, along with all the news crews of the day that were pointing their lenses in Steve’s direction continually. But the “Holy Grail” for us was the hours and hours that Steve insisted on shooting of the Racing as they tried to figure out what the script would be. Everyone thought it lost or destroyed. We had a couple of leads that were dead ends. But a late night call to an editor who worked on the film led us to a facility where they worked on the film. We approached them and two days later they came back saying that under a sound stage were between 400 and 600 boxes with the words “Le Mans” on the side. Despite the challenges that went into making the film, it’s still appreciated by many (particularly the Japanese). How do you think the film holds up? Pretty much every racing fan we have spoken to adores this film. Pretty much every fan of cinema says the exact opposite. The film is confused. You can see the different elements fighting with each other on the screen. The first 40 minutes plays like a documentary – this is the idea that Steve and John Sturges had. It was pretty groundbreaking and still is a beautiful, unique opening to the film. Then the story – and what script there is – enters and, in our opinion, it feels like an afterthought. However, it is interspersed with the most incredible racing footage – visionary rigs, cameras, ideas. Brave, brave filmmaking. This holds up today. Completely. Could Le Mans be made today? Not a chance. Can you imagine getting the best drivers in the world together for 3 months to risk their lives every day to make a film? The cost? The insurance? The sponsors’ permission? It’s a different world now. The making of the film has been discussed in his biographies and in print before, what untold stories did you unearth in the making? It’s important to reveal something new in documentary. The stories already out there to a point were fascinating, but we wanted to reveal new things and we feel we have. We were able to show how Steve reacted to David Piper’s accident for the first time. And show this to David for the first time on camera, which is a big moment in the film. We were able to tell the story of Alan Trustman – Steve’s writer on Bullitt and Thomas Crown – and how his falling out with Steve impacted upon his career. We travelled to Sweden to see Louise Edlind, a young actress in 1970, and to find out about a rumour involving her and Steve and an accident that was covered up. And we were able to show Steve McQueen in a different light though our choice of interviewee. Essentially we are telling an unknown story about Steve McQueen the film star on screen for the first time. This has been supplemented by the newly discovered footage and by some of those closest to McQueen talking for the first time. Why is important that people see Le Mans and should they see your documentary before or after watching it? That’s a tough one to answer. I watched Le Mans at the start of the process and felt one way about it. After finding out what went into the film I see it in a completely different light. I like it better, I understand it more – and appreciate it much more. So I suppose I’d say watch the documentary and then go and watch – or re-watch – the film. A lot of people have said, on coming out of the documentary, that they want to go and see the film now. I think it will make a lot more people feel the same. And I think if they do they will see the elements in the film that Steve was trying to achieve shine a bit brighter. There is some visionary filmmaking going on in there. And at times even the non –racing fan may well feel like he or she ‘is behind the wheel of a racing car’ which was Steve’s ultimate goal. You can buy tickets to see this documentary and many others right here as part of the Jalopnik Film Festival in Los Angeles on September 25th and 26th.